As most children, growing up I showed little appreciation for what I had, coveting instead what I did not. Now I realize how fortunate I have been to have grown up half the time in a metropolis and the other half at the countryside. At the farm. A subsistence farm, although I truly loathe the term because we were not just subsisting but thriving off the land, as we planted and harvested a bit of everything and we had a specimen or four of almost all the farm animals, from bipeds to quadrupeds. I got on this memory lane after reading the paper of Shinozaki et al. (2018) on tomatoes. It was a difficult read for me as it was punctured by many term definition lookups since botany evolved quite steeply since the last time I checked, about 25 years or so. Red ripe stage (full red for 8 days, ≈ 50 DPA). Fig. 1 (partial from Shinozaki et al., 2018). A tissue/cell-based transcript profiling of developing tomato fruit. a Traced image of six targeted fruit tissues. Shaded areas of the total pericarp and the placenta were not harvested. b Traced image of five pericarp cells. c Representative pictures of harvested fruit spanning ten developmental stages. d Representative pictures of the stylar end of MG and Br stage fruit. DPA, days post anthesis; MG, mature green; Br, breaker; Pk, pink; LR, light red; RR, red ripe. Credit: DOI: 10.1038/s41467-017-02782-9. License: CC BY 4.0 IL. Immediately after harvesting, the tomato was scanned with a micro-computed tomograph (micro-CT) to generate a 3D image of the fruit, including its internal structures. Then, the fruit was dissected by hand or laser, depending of its size, divided into various tissue types and then preserved either via snap-freezing in liquid nitrogen or standard tissue fixation for light or transmission electron microscopy. Finally, the researchers used kits to extract and analyze the RNA from their samples. And, last but not least, a lot of math & stats. A total of 24,660 genes were uniquely expressed in various tomato cell types and at various stages of development. The tomato ripens from within, meaning from the interior to the exterior and not the other way around. The ripening seems to be a continuous process, starting before the ‘Breaker’ stage. The ripening signals originate in the locular tissues (the goo around the seeds; it’s possible that the seeds themselves send the signals to the locular tissue to start the ripening process). The flesh of the fruit is only one part of the tomato and the most investigated, but the other types of tissue are also important. For example, some genes responsible for aroma and flavor (CTOMT1, TOMLOXC) are predominantly or even exclusively expressed in the flesh, but some genes that improve the nutritional value (SlGAD3) are expressed mostly in the placenta. The fruit can do photosynthesis, probably for the benefit of its seeds. Botany, like any serious science, is complicated. Ah, I have been vindicated. By science, nonetheless! You see, in my pursuit to recapture the tomato taste of my childhood I sample various homegrown exemplars of Solanum lycopersicum derived both from more or less failed personal attempts with pots on the balcony and from various farmer’s market vendors. While I can understand – though not approve of – the industrial scale agro-growers’ practice to pick the tomatoes green, unripe and then artificially injecting them with ethylene to prolong shelf life, I completely fail to understand the picking them up when green by the sellers in the farmer’s markets. I had many surreal conversations with such vendors (I cannot call them farmers for the life of me) who more than once attempted to reassure me that 1) Everybody’s picking tomatoes green off the vine because that’s how it’s done and 2) Ripening happens on the window sill. In vain have I tried to explain the difference between ripen and rotten; in vain have I pointed out that color is only one indicator of ripening; in vain did I explain that during ripening on the vine the plant delivers certain substances to the fruit that lead to changes in the flesh composition to make it more nutritious for the future seedling, process that the aforesaid window sill does nor partake in. Alas, ultimately, my arguments (and my family’s last 400 years of farming experience) hit the wall of “I am growing tomatoes for three years now and I know what I’m doing. Are you buying or not?” As you might imagine, I end up going home frustrated and yet staring at some exorbitantly expensive and looking as sad as I feel greenish tomatoes. Now we know that… simply put, I’m right. Sometimes is good to be right. I am old enough to prefer happiness and tranquility over rightness & righteousness, but still young enough that sometimes, just sometimes, it feels good to be right. Yes, the Shinozaki et al. (2018) paper exists only for my vindication in my farmer’s market squabbles and not for providing a huge comprehensive atlas on the tomato transcriptome, along with an awesome spatiotemporal map showing the place and time of the expression of genes responsible for fruit ripening, quality traits and so on. Good job, Shinozaki et al. (2018)! Memory processes like formation, maintenance and consolidation have been the subjects of extensive research and, as a result, we know quite a bit about them. And just when we thought that we are getting a pretty clear picture of the memory tableau and all that is left is a little bit of dusting around the edges and getting rid of the pink elephant in the middle of the room, here comes a new player that muddies the waters again. DNA methylation. The attaching of a methyl group (CH3) to the DNA’s cytosine by a DNA methyltransferase (Dnmt) was considered until very recently a process reserved for the immature cells in helping them meet their final fate. In other words, DNA methylation plays a role in cell differentiation by suppressing gene expression. It has other roles in X-chromosome inactivation and cancer, but it was not suspected to play a role in memory until this decade. Oliveira (2016) gives us a nice review of the role(s) of DNA methylation in memory formation and maintenance. First, we encounter the pharmacological studies that found that injecting Dnmt inhibitors in various parts of the brain in various species disrupted memory formation or maintenance. Next, we see the genetic studies, where mice Dnmt knock-downs and knock-outs also show impaired memory formation and maintenance. Finally, knowing which genes’ transcription is essential for memory, the researcher takes us through several papers that examine the DNA de novo methylation and demethylation of these genes in response to learning events and its role in alternative splicing. Based on these here available data, the author proposes that activity induced DNA methylation serves two roles in memory: to “on the one hand, generate a primed and more permissive epigenome state that could facilitate future transcriptional responses and on the other hand, directly regulate the expression of genes that set the strength of the neuronal network connectivity, this way altering the probability of reactivation of the same network” (p. 590). Here you go; another morsel of actual science brought to your fingertips by yours truly. Posted on September 22, 2016 September 23, 2016 by NeuronicusPosted in 2016, Epigenetics, Genetics, Learning & Memory, Molecular Neuroscience, YearTagged alternative splicing, DNA methylation, DNA methyltransferase (Dnmt), epigenetics, learning, memory, memory formation, transcription. Here comes a study that answers that very important question. Eloy et al. (2016) looked at the most common pediatric eye cancer (1 in 15,000) called retinoblastoma (Rb). In the hereditary form of this cancer, the disease occurs if the child carries mutant (i.e. bad) copies of the RB1 tumour suppressor gene located on chromosome 13 (13q14). These copies, called alleles, are inherited by the child from the mother or from the father. But some children with this genetic disadvantage do not develop Rb. They should, so why not? The authors studied 57 families with Rb history. They took blood and tumour samples from the participants and then did a bunch of genetic tests: DNA, RNA, and methylation analyses. They found out that when the RB1 gene is inherited from the mother, the child has only 9.7% chances of developing Rb, but when the gene is inherited from the father the child has only 67.5% chances of developing Rb. The mechanism for this different outcomes may reside in the differential methylation of the gene. Methylation is a chemical process that suppresses the expression of a gene, meaning that less protein is produced from that gene. The maternal gene had less methylation, meaning that more protein was produced, which was able to offer some protection against the cancer. Seems counter-intuitive, you’d think less bad protein is a good thing, but there is a long and complicated explanation for that, which, in a very simplified form, posits that other events influence the function of the resultant protein. Again, epigenetics seem to offer explanations for pesky genetic inheritance questions. Epigenetic processes, like DNA methylation, are modalities through which traits can be inherited that are not coded in the DNA itself. Posted on July 25, 2016 July 25, 2016 by NeuronicusPosted in 2016, Epigenetics, Genetics, Humans, Pathology, YearTagged allele, autosomal dominant, cancer, DNA methylation, epigenetics, eye, humans, mutant, pediatric, retinoblastoma, tumor suppressor. Transgenerational epigenetic inheritance (TGI) refers to the inheritance of a trait from one generation to another without altering the DNA code (normally, evolution is driven by changes in the DNA itself). Instead, it happens by modifying the proteins that wrap around the DNA, the histones; these histones, in turn, control what genes will be expressed and when. Until a decade ago, TGI was considered impossible, nay, a scientific heresy since it had too close of a resemblance to Lamarckian evolution. But, true to its guiding principles, the scientific endeavor had to bite the bullet in front of amassing evidence and accept the fact that it may have been a kernel of truth to the so called ‘soft inheritance’. Anway et al.’s paper was one of the first to promote the concept, ten years ago. They exposed pregnant rats to the pesticides vinclozolin or methoxychlor (only vinclozolin is still used widely in U.S.A. and several EU countries, particularly in agriculture, wine production, and turf maintenance; methoxychlor was banned in the early noughts). The authors found out that more than 90% of the male offspring had “increased incidence of male infertility”. These effects were transferred through the male germ line to nearly all males of all subsequent generations examined” up to great great grandsons, inclusively (Anway et al., 2005). (I don’t want to speculate how they managed to breed the low fertility males…). That doesn’t mean that the F5 generation was OK (the great great great gransons); it means that they stopped investigating after the F4 generation (or they couldn’t breed the F4s). Moreover, the mechanism of inheritance seems to be altered methylation of the DNA histones of the male germline, and not alteration of the DNA itself. Females were affected too, but they didn’t have enough data on that experiment (the Ph.D. student that did the work had to graduate sometime…). 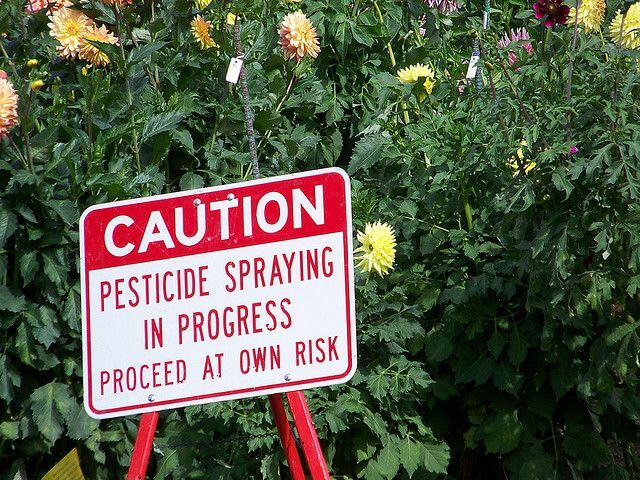 Although the authors used higher amounts of pesticides than they suspected back then, in 2005, to be found in the environment, the study still gives pause for thought. After all, it has been 10 years since this paper plus the previous 20 years of use of the stuff. And no, you cannot get rid of it by washing your grapes and vegetables really thoroughly.